I thought I'd try planting this cutting, so I took some pics (I haven't figured out how to position them in the post the way I want yet... I'm still working on that). For anyone who's never planted a cutting before, it's pretty easy... you simply put some potting soil at the bottom of the pot, then hold the cutting above it in the middle and scoop in more soil around it. I prefer this method to filling the pot and scooping out a hole because I find it less messy, and I end up with better results. Cool! I love seeing progression photos. I love rosemary--the scent and the taste. There was a pot of rooted rosemary cuttings outside that I decided to put in the greenhouse for the winter, just for the fragrance. 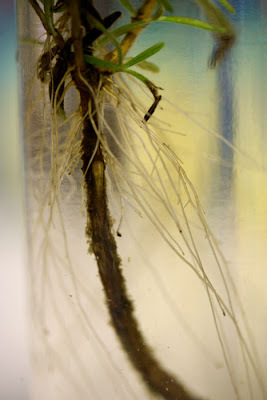 I rooted my cuttings by just taking a little heel with the cuttings and sticking them in soil. 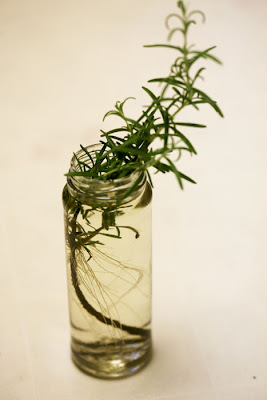 I love rosemary too :) We have a giant bush in the back garden that I take my cuttings from. 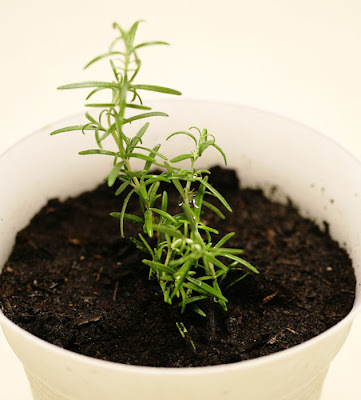 Now that I'm starting a couple of indoor potted plants I'm looking forward to having fresh rosemary year round.